Or, What on earth is the Resurrection? Then I saw…a Lamb standing as if it had been slaughtered…. The Church preaches Christ the risen crucified One and confesses him as Lord to the glory of God the Father. Today, I want to ask a question I can’t answer, not this Sunday and not even in a month of Sundays. But even so, it’s still a very good question to ask. The question is this: What is the Resurrection? It’s a deceptively simple question. Only one word has more than one syllable. But ‘Resurrection’ is a big word. How can we think about the Resurrection of Jesus? Is the Resurrection a happy ending to a sad story? It could easily look that way; and the story has been told that way. Everyone was sad on Friday and Saturday, but by Sunday they were happy once more because Jesus was alive again. But the Resurrection is no happy ending. Most of those first witnesses lost their lives because of the Resurrection. Well, maybe the Resurrection a proof of life after death? Again, the story has been told that way. But that’s not how the Gospels tell it. The risen Jesus doesn’t talk about heaven. He instructs his people to make disciples of all nations, baptise and teach them. He forgives Peter, telling him to feed his sheep. He gives his peace to disciples who had let him down big time. He makes them breakfast. He helps them to be unafraid of death. He points them towards a transformed life here and now on earth. Well, the empty tomb may be the clue we need. Does the empty tomb prove the Resurrection? No, it does not. I realised this with a big thump the day after my father’s funeral. I had returned to his grave to make a quiet space to pray. It struck me then that had my dad’s grave been empty, I would not have immediately concluded that he had risen from the dead. I would have made the ghastly assumption that someone had stolen his body, and called for the police. The Easter stories in the Gospels are exactly the same. When the women see the empty tomb, they do not immediately assume that Jesus has been raised from death. They have to be told the news. Told by an Angel of the Lord (Matthew), a young man in white (Mark), two men in dazzling clothes (Luke) or a ‘gardener’ who was Jesus himself (John). The women didn’t believe that Jesus was risen because the tomb was empty. They believed because they had a life-changing encounter with the Christ who had been crucified and who is now risen. And there were other encounters. Remember the two who were joined by a stranger on their miserable way to Emmaus? He made their hearts burn as he opened the scriptures on the way, showing how the Messiah should suffer; and then, at the table they knew him in the breaking of the bread. Today, we may encounter the Lord in the same way, in these means of grace he has given us, the scriptures and the eucharist. Remember Thomas? Thomas wasn’t convinced that Jesus had been raised from the grave—but he was fully convinced when he saw the wounds that had been inflicted upon Jesus. I too have met people who have responded to the wounds that life has brought by allowing themselves to be transformed into being more Christlike. I have seen the risen crucified Lord in them. Remember the disciples by the lake? Jesus made them breakfast. There are people who the Lord shines through because they know how to gladly serve others. The Uniting Church’s Basis of Union calls the Lord ‘the risen crucified One’ (Para.3). When we speak of the risen Lord, we must always remember what the empty tomb does tell us: that it is the crucified One who is risen. The risen Lord hasn’t set the cross aside. He hasn’t put it in a cupboard somewhere. The body of Jesus is not something separate from his living presence. Jesus is the risen crucified One. Jesus once said ‘where two or three are gathered in my name, I am there among them’. He is here as the risen crucified One. You may wonder why I’m labouring the point so much. All of this is raised in Jesus. It’s not just a happy ending, or the resuscitation of a corpse. It is eternal life itself embodied in the risen crucified Lord Jesus Christ. That is who is in our midst today, and wherever two or three gather in his name. When Jesus the risen crucified One is in the midst of the two or three who gather in his name, he brings his family along. He brings the poor, the sick, the detained and the starving. He bears their wounds in his risen crucified body and calls his church to share the work. must reign until he has put all his enemies under his feet. The last enemy to be destroyed is death. We still look for the fullness, the completion of Christ’s work. In the meantime, by faith we share in the overcoming of death as we look to God for eternal life. Some Christians are embarrassed by their wounds, or even put to shame. They think that God will bless them so much that nothing bad should happen to them. That is not right. We know Jesus as the risen crucified One. He bears our wounds in his. who died, was buried, and rose again for us. To God be glory forever. I’m not sure he knew what an enemy was, and since then this particular lad has gone on to make good friends and to be a good friend. But isn’t that just like life? Aren’t we being told all the time who our enemies are? Our enemies are Muslims and asylum seekers, they are environmental greenies and gays who want to be married. It’s important to know who your enemies are. For the kingdom of God is not food and drink but righteousness and peace and joy in the Holy Spirit. I have to say this: I’m getting on a plane tomorrow to go to the Holy Land. A number of us are going on a tour together, and we’ll find out soon enough if Jerusalem is “a joy”, and its people “a delight”. Someone told me the other day that you can feel that something special happened at Jerusalem. I’m really hoping that’s what we’ll find, anyway. This passage from Isaiah is full of hopeful words, isn’t it? It was written to people whose parents and grandparents had been carted off into Babylon, in present-day Iraq, after Jerusalem had been destroyed. After about seventy years, they were allowed to return so they could rebuild. But it was hard. The new Jerusalem they were building wasn’t a patch on the old, and they knew it. Do yourself a favour and read the rest here! and surprise us with hope. It’s the Sunday after Easter, and we’re getting reacquainted with the Apostle Thomas. ‘Doubting’ Thomas to his friends. Jesus has appeared to the frightened huddle of disciples on the evening of the first Easter Day, but Tom wasn’t there. We don’t know why he wasn’t there. We only get a few tantalising glimpses of Thomas, but he seems to me like an all-or-nothing kind of bloke. When Jesus says he’s going to Jerusalem, Tom says Let’s go with him and die. Now, Jesus is dead and everything has gone. I wouldn’t be surprised if he were down the Jerusalem Arms or the King David pub drowning his sorrows and crying into his thirteenth beer. anyone hung on a tree is under God’s curse. And a ‘tree’ included a cross. Jesus was under a curse from God. The dream turned out to be a nightmare. It was all over. Christ is risen! Hristos voskrese! ХРИСТОС ВОСКРЕСЕ! 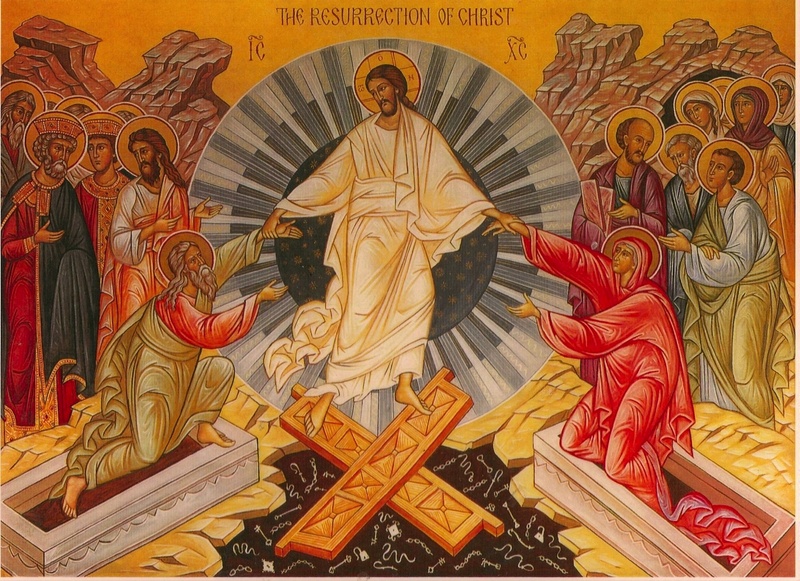 Hristos voskrese, Christ is risen! An Orthodox Easter song from Serbia, and a lovely video.